So here it is…after months of waiting… the post that so many of you wanted to read, wanted to know more about. I do apologise for this long delay, not intentional really but sometimes you do tend to block out the past in the daily grind of the present and I have always liked living in the present. But for once I have managed to give a little pause to the everyday clutter of my daily life to take you to another world. A world very different from the present, a world that belonged to a carefree, young girl. 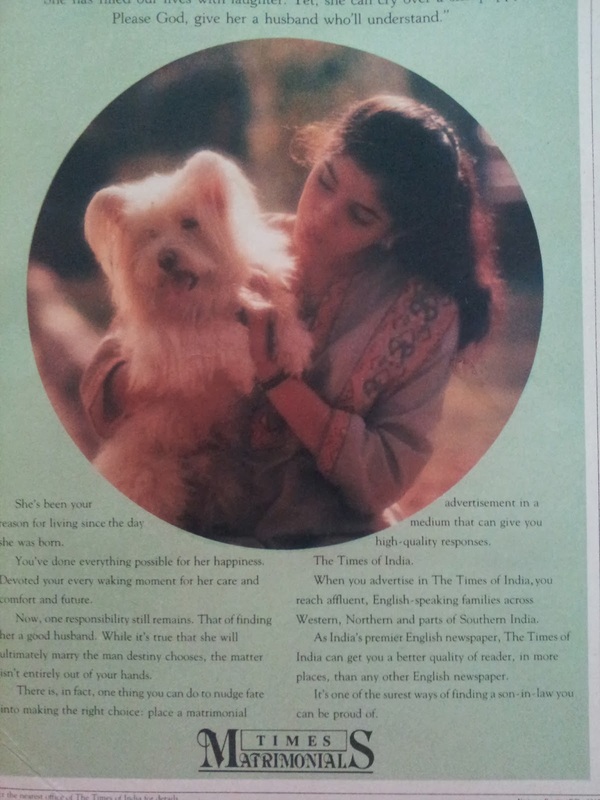 The story of an ‘almost’ Miss India, a story that begins almost 20 years ago…..gosh was it that long ago? I was 17, in college, enjoying my new found freedom after the school regime. It was not so much about leaving school that made me happy, it was more about not having to wear the same navy blue and white uniform every single day! So I went berserk shopping – new clothes, shoes, accessories, establishing a style that I liked and was comfortable in. Without sounding too pompous, I think I was pretty. I attracted attention wherever I went, and with that came a certain kind of an advantage. I could get my way through long queues with a smile, have strangers vacate their seats for me in crowded buses and never had a problem finding a taxi at any time of the day! I started modelling around the same time, all thanks to the encouragement and hard work of my mother, who helped me build contacts and do all the hard work of distributing photographs to ad agencies and photographers. Shampoos, sarees, jeans, perfumes – I happily posed for everything. I even tried my hand at a few fashion shows but that didn’t appeal to me so much, so I continued my modelling stints limiting to press and ad films. I also started taking part in local beauty competitions winning most of them. This encouraged me to do something on a bigger scale. Again with my mother’s encouragement I decided to take part in the national beauty contest – Femina Miss India. Now not many people know that I had taken part twice in Miss India. The first time was in 1992. This was the year Madhu Sapre was crowned the winner. I still remember her in a pure white saree walking confidently up on stage onwith a flashing smile, towering over all others with her fantastic height. Miss India contests in those days were just a one evening affair. The contestants were short-listed throughout the country and then brought all together to Bombay to participate in the contest. We had to do our own make-up, hair and had to be ready in our sarees. Honestly I do not remember minute details about this contest, not even what I wore. No one thought of taking my photographs I guess so I am left with a hazy bunch of memories. Anyway it all happened so fast…in just a 3-hour evening the contestants were made to talk, walk, parade and then it was over! The results were announced and I got the fourth place enabling me to participate in the Miss Asia Pacific contest. I wasn’t ecstatic but I wasn’t unhappy either. Not only did I become a mini-celebrity in college, I also bagged a lot more modelling offers! That year Madhu Sapru went on to the Miss Universe pageant and shook the country by becoming the second Runners Up! Now that was big progress for the Indian beauty pageant scene, whose last and only victory in any Miss Universe contest, was with Yasmin Daji standing 3rd in 1966. Suddenly things started changing became more professional. I got to experience this change myself as two years later I got ready to take part in the contest once again. I was selected for the finals after two rigorous rounds of selection in Mumbai and I started getting geared up for the finals of Femina Miss India 1994 which was going to be held in Goa. This time there was a whole lot of publicity associated to the event. We were called for a few sponsored sessions to create more publicity pre-event. I got my dresses, shoes and accessories in place. We still had to do those on our own. Luckily I had my Miss Asia-Pacific wardrobe in place which had cost a fortune, but my mum sponsored me all the way. My sister was another big support as she was constantly guiding me on what to wear, how to wear, the art of make up, how to sit, how to stand, how to talk and whatever associated with it. I was never very good at all this – the acting and flaunting business. I did what came naturally and that was exactly why I did NOT win. 6th from top left….It’s me! Finally the day dawned when I had to pack my bags and leave for Goa. All the girls were to meet at a specific point at the airport. Vanity cases, strollers, the click of heels are some of the things I can still remember from that day. Another thing I can never forget is that face. The face that stood out from all others at the airport. There was minimal make up and yet one would want to turn around and grab a second look at her. If you haven’t guessed already I am talking about Aishwarya Rai. I had met her a couple of times before that during some modelling assignments, when she was still a struggling model like most of us. She would always keep to herself and be chaperoned by her mum. 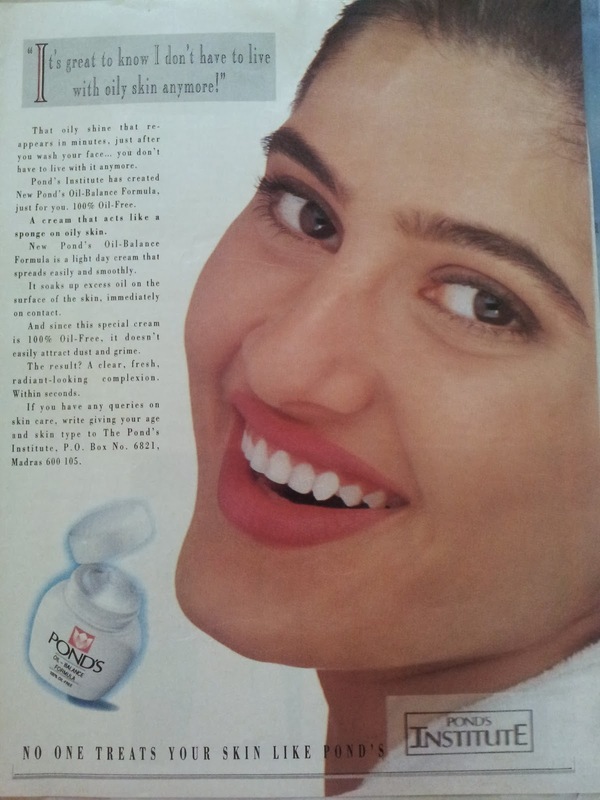 But then suddenly one fine day she shot to fame and her face was plastered on most big-time brands! Having her as a contestant amongst us relatively unknown faces, just didn’t seem fair! By the time we reached our hotel, I got a sense that this was NOT going to be one of the most memorable experiences of my life. Fun time was over, as I could sense competition in the air. Girls who had otherwise been friendly in the aircraft had suddenly gone mute, the camaraderie fading away, the organisers shouting out instructions. I didn’t have much time to analyse as we we were asked to freshen up and meet again in the lobby for some photoshoot. Some girls from other towns and cities had taken connecting flights to Bombay and had been on their feet for more than 24 hours! We were all exhausted. After that all that I can remember is a blur of rehearsals, video shoots, interspersed with the sub-contests organised. The Miss 10, Miss Vivacious, Miss Congeniality – the more these contests took place, the more I realised that I was really not prepared for this world of glamour, the world of showing off what you are not. At the breakfast buffet while I would merrily fill my plate with bread buns, jam and omelette, others would be picking at fruits or having healthy juices. While I would roam around wearing causal shorts to beat the heat, some others would be wearing full make up and gowns! I tried my best to fit in, but within a day or two I just wanted to go back home. I felt very much out of place and homesick. The feeling of unfairness also kept building up as we saw most of the judges talking Aishwarya and greeting her during the sub-contests and it came as no surprise when she won one of them! During those few days in Goa I barely interacted with her. After the rehearsals most of the girls would retreat to their rooms while I would be pacing around trying to befriend someone, anyone! While I didn’t pay much attention to the final winner – Sushmita Sen, I do remember her smoking quite a bit behind the scenes. But she always looked focused, practising her poise, her diction, while I was whiling away my time, waiting to go home! The day of the event. There were butterflies in my tummy since that morning as I tried hard to look cool and composed. We went through our rehearsals one last time and then everyone started getting ready. As against the previous Miss India contests, make up and hair stylists were provided for us. My mother along with my sister and her fiancé had arrived in Goa the night before. At least someone will clap for me in the audience, I thought! Now to be honest I don’t remember the exact sequence of events that night. We had four rounds. Each round had its own elimination taking place based some some criteria given. I was pleasantly surprised when I coasted through the first two rounds, confidence building each time. In round three which was Q&A round, I was pleased to get my all-time favourite actor, Rishi Kapoor as the one on the judges to ask me a question. His question was “If you had to choose between two men, one rich but ugly and the other poor and handsome which one would you choose and why?” Now a smart Ms. India finalist who knew the ways and means of this contest would have selected a ‘poor but smart’ option adding that she would toil hard by his side day and night to make ends meet! I, however was an honest girl who hadn’t done her home work well and my reply was instantaneous – rich and ugly, already making a mental note that we could do plastic surgery on his face with all that money! The crowd gave a decent applause. Either they were delighted with an honest answer or laughing at my stupidity. I was selected for the next round. Finally it was time for the results to be announced. In the reverse order Miss India Asia Pacific crown went to Francesca Hart who was a tall, sweet looking girl from North India. I got to learn later that she couldn’t go for the International contest and that Shweta Menon was sent in her place. After that the Miss India World winner was announced. We all held our breath and were completely shocked when Aishwarya’s name was called. It took us a whole minute to realise that she was not the winner of the big crown after all. 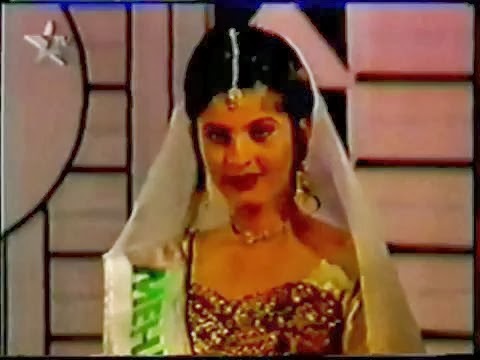 The Miss India Universe 1994 is Miss Sushmita Sen! The drama wasn’t over yet as minutes later a tearful Aishwarya came running to the dressing room and was soon surrounded by her bunch of professional friends ready to console her. Having had enough excitement for a day I walked out into the crowd looking for my mother. I am still a part of the crowd today, as inconspicuous as everyone else, the faint spot light that once shone on me long gone. And yet I believe that each one of us is conspicuous in our own way. In our little world that we have created for ourselves. The people whom we have chosen as our life partners, the little lives whom we have brought into this world, are all greater accomplishments I would say, and as such we all are Miss Indias or Miss Worlds in our own right! You are so beautiful. Amazing write-up! Oh, so you took another direction. the crown would have meant a lot, but in the end, you are a winner because you chose to stay the way you are!!! lovely reading the inside view of the contest..and u look stunning in ur pictures! My name is Anamika Chatterjee and I am a journalist based in Dubai. Wanted to get in touch with you for a story? Can you please share your contact deets on anamika.chatterjee@itp.com? Yes, surely. We need more such super Indian bloggers like you in Hong Kong. Very well written my friend and totally love the last bit about being conspicuous in our own ways 😉 And needless to say but still, what gorgeous photos!! I saw the video of your appearance…My God.. you were so graceful and pretty!! Hey +Reena Gupta I don’t know how but I had totally missed reading this comment from you. It s so sweet and genuine that I am replying to you even though it;s been a whole year! Yes the experience was fabulous, sometimes I feel like it was a dream, there is absolutely no connection to my present. And yet we have the pictures to prove otherwise 🙂 Thank you for all your lovely compliments, as we grow older we do realise that there is some meaning behind the age old adage – Beauty is only skin deep. Thank you +Mandira Adhikari . That’s the aim for us mothers – inspire each other and learn from each other’s mistakes. So happy to hear that you are following my journey. It was lovely reading your blog. I am a journalist and I write for Ahlan! Masala magazine in Dubai. 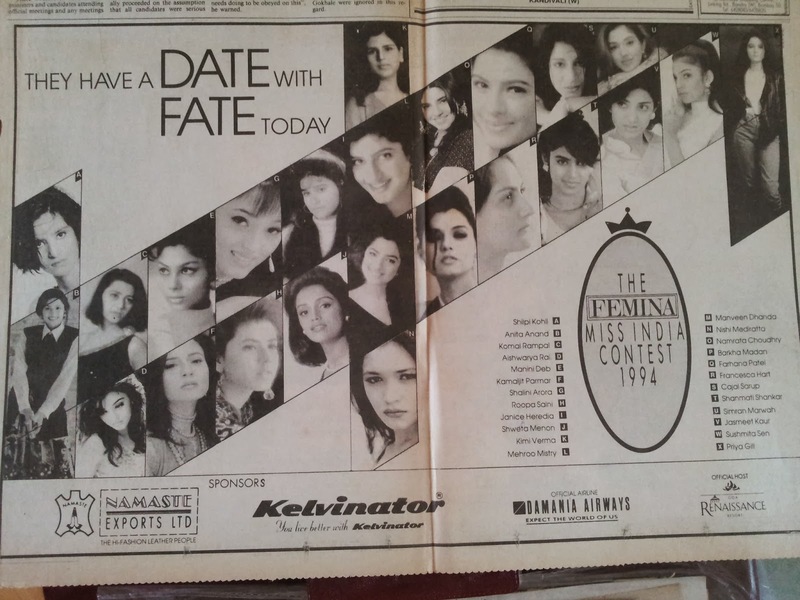 We are doing a feature story on the 1994 Miss India contest. I’d be glad if you could share some insight with me. Or help me with more details. Do let me know how can I get in touch with you. You can contact me on my mail id preeti04k@gmail.com or if you share your email id, I can write to you. Hi @preeti….apologise for the late response. I guess you would have finished your article by now, but if you still need any details just give a shout! Good luck. Liked your honesty, not many people have guts to utter what they think to such a huge audience, Kudos to you..